February 14th of each year is 情人节 (Valentine’s Day). It is a traditional festival in Western countries. Young people in China also like this festival very much. This is a celebration of love and romance traditionally expressed with flowers and chocolates. The couple in love give each other gifts on this day to express their affection for each other. In China, people take the traditional Double Seventh Festival as Chinese Valentine`s Day. This festival draws back to the Han dynasty, but the traditional celebration has nothing to do with activities such as dating. It was borne of the legend of the cowherd牛郎(niú láng) and the weaver girl 织女(zhīnǚ), and how their love was forbidden, so they were banished to opposite sides of The Silver River. However, once a year, on the 7th day of the 7th lunar month, a flock of magpies would form a bridge to reunite th two. This gave the meaning of Chinese Valentine` Day to this festival. Traditionally, Chinese people also take the Lantern Festival (元宵节 yuánxiāojié) as Chinese Valentine`s Day. It is the first night of the year in which the moon is full and hanging high. This is a great chance for young people to go out and date while enjoying the lanterns on the streets. 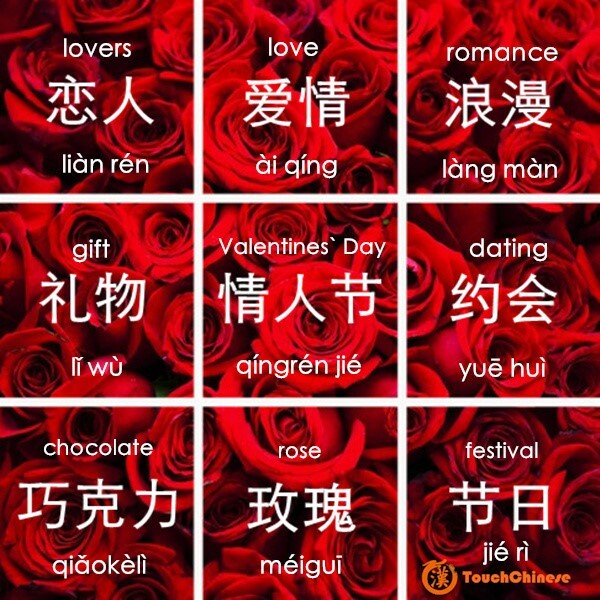 Here are some words and expressions about Valentine`s Day and love in Chinese. 你是唯一 nǐ shì wéiyī You’re the only one. 鹊桥 quèqiáo The bridge of magpies, which the Weaver girl crosses to meet the Cowherd on the 7th of the Seventh lunar month. 乞巧 qǐqiǎo The legend says that women pray for cleverness every seventh evening of the seventh lunar month.